John Edwards (not the Democratic presidential candidate, we presume) submitted this picture: "This is a photo of the I&E cymbal champions from Spirit of JSU shortly after the awarding of the medals on semifinals night. Also shown is the cymbal instructor (and all around great guy) Andrew Nixon (right), as well as cymbal instructor Eddie Capps (left). Andrew and I marched together back in Spirit of Atlanta in 1995 and have since both moved on to teach corps in the Southeast. Good luck defending your title this year guys! "I'm a video game designer living in the L.A. area after moving from Atlanta, where I marched with the Spirit of Atlanta from 1993 to 1995. 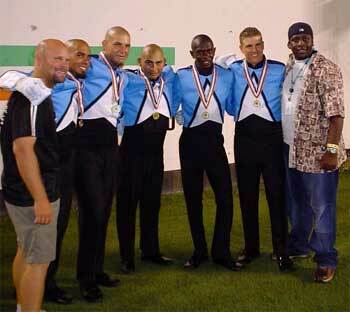 I was also on the visual staff with the Teal Sound from Jacksonville, Fla., during the 2001 season. Hopefully I can get some time off from my busy schedule to continue with my drum corps career out here in sunny California!" All right John. Good luck against John Kerry in Wisconsin today.